B seems to be becoming more and more like A.
Burma, 1852. Arthur Bowman, a sergeant in the East India Company, is sent on a secret mission during the Second Anglo-Burmese War. But the expedition is foiled – his men are captured and tortured. Throughout their ordeal, a single word becomes Bowman’s mantra, a word that will stiffen their powers of endurance in the face of unimaginable suffering: “Survival”. But for all that, only a handful escape with their lives. Painter Nick Steyn moves to the City Bowl in Cape Town after separating from his partner, Isabel. A young boarder moves in with Nick and they soon become friends. But one night she does not come home, and his attempts to trace her come to nothing. A few weeks later the prosperous artist Buks Verhoef makes an offer on Nick’s house. Is there a connection between these events, and if so, could Nick’s former friend, Victor Schoeman, the author of the outrageous novel The Shallows, have a hand in them? A parallel narrative concerns a nameless Stellenbosch woman who is writing a monograph on the famous Olivier brothers. One day she witnesses the murder of Buks Verhoef in a coffee shop; soon thereafter a sinister man starts stalking her. Could this also be Victor Schoeman? A fantastical, absurd yet haunting novel by the award-winning novelist Ingrid Winterbach. Translated as always by Michiel Heyns. On the coldest day of the year, Sweden’s Minister for Justice steps out of Parliament House and into a blizzard – and disappears. That same night, across the Baltic Sea, a Danish celebrity finds a stranger lurking in her snow-bound home. One is a surgeon who carefully dissects his victims. The other is a brutal predator who targets women. Police in Stockholm and Copenhagen are closing in on their suspects. But as winter darkens and more people die, their investigations begin to unravel. ‘More gripping than Jo Nesbo, blacker than Stieg Larsson and more bleakly human than Henning Mankell.’ Tony Parsons. ‘Atmospheric and complicated … with great cop characters and some imaginatively grisly perps.’ Star Pick – The Sunday Times. ‘Swedish crime writer of the year. Bliss‘ Irish Times. ‘Grips like a vice.’ Irish Independent. Frost-demons have no interest in mortal girls wed to mortal men. In the stories, they only come for the wild maiden. Chile, 1988. The Human Solutions team (a detective, a psychologist, and an actor) work together to engineer social situations to help their clients with anything they might need – until a case leaves one of them tangled in a cult run by an ex-Nazi with torturous ties to the Pinochet dictatorship. And he is good. Javier’s manipulations never fail because he controls every moment of every interaction – he is precise, observant and emotionally ruthless —and this has served him well. But then one day he slips. He falls for a woman, and against his better judgment, and the council of his associates, Javier takes on her case – a case he would never touch under ordinary circumstances. The woman’s name is Elena, and her son is locked behind the well-armed walls of a cult masquerading as an educational institution. She wants him out, so Javier agrees to go in. Once behind the walls of the compound, Javier meets a man who is running a larger-scale social manipulation than he ever thought possible. The man is Peter Wenzel—or Uncle Peter, as he insists on being called—and as the charismatic leader of the cult he deftly manipulates his followers through a complicated system of fear, deception and brutality. Uncle Peter is an ex-Nazi, expelled from Germany for molesting children, and his ties with General Pinochet—Chile’s barbarous dictator—are extensive and terrifying. He is a man with no conscience or fear—and Javier quickly realizes that he may have met his match. In The Refugees, Viet Thanh Nguyen gives voice to lives led between two worlds, the adopted homeland and the country of birth. From a young Vietnamese refugee who suffers profound culture shock when he comes to live with two gay men in San Francisco, to a woman whose husband is suffering from dementia and starts to confuse her for a former lover, to a girl living in Ho Chi Minh City whose older half-sister comes back from America having seemingly accomplished everything she never will, the stories are a captivating testament to the dreams and hardships of immigration. The second piece of fiction by a major new voice, The Refugees is a beautifully written and sharply observed book about the aspirations of those who leave one country for another, and the relationships and desires for self-fulfillment that define our lives. “The novel beats with a present-day urgency–a nation at war with itself, the unbearable grief of a father who has lost a child, and a howling congregation of ghosts, as divided in death as in life, unwilling to move on.” Vanity Fair . From our ancestors’ first forays through the continent, to the contemporary diaspora spread around the world, people are eternally moving in, out and about the African continent. Not everyone leaves of their own volition, and not everyone comes with the best intentions: nevertheless, the story of Africa is the story of souls migrating, settling, unsettling, fleeing, seeking, resting, nesting and sharing stories, experiences and myths. From treks both physical and spiritual, journeys both internal and across continents, from the comfort of ancient myth to the desperation of those currently fleeing their homes, Short Story Day Africa latest collection brings a fresh, urgent perspective to one of our most profound phenomena, and the basis of all our greatest stories. The twenty-one exciting voices, both new and established, including Mirette Bhagat Eskaros, TJ Benson, Arja Salafranca, Sibongile Fisher, Fred Khumalo and Karen Jennings, make Migrations a moving, informative and immersive read. When Chris Hani, leader of the South African Communist Party and heir apparent to Nelson Mandela, was brutally slain in his driveway in April 1993, he left a shocked and grieving South Africa on the precipice of civil war. But to 12-year-old Lindiwe, it was the love of her life, her daddy, who had been shockingly ripped from her life. In this intimate and brutally honest memoir, 36-year-old Lindiwe remembers the years she shared with her loving father, and the toll that his untimely death took on the Hani family. She lays family skeletons bare and brings to the fore her own downward spiral into cocaine and alcohol addiction, a desperate attempt to avoid the pain of his brutal parting. For as long as I can remember, I’d grown up feeling that I was the daughter of Chris Hani and that I was useless. My father was such a huge figure, such an icon to so many people, it felt like I could never be anything close to what he achieved – so why even try? Of course my addiction to booze and cocaine just made me feel my worthlessness even more. What does South Africa’s balance sheet look like? Are we already a failed state? How strong is our democracy really? What can we, as ordinary South Africans do? This book gives perspective on burning issues, including education, the rule of law, lack of service delivery, the ailing economy, corruption, cronyism and the predator state. Eloff’s fresh, fact-based analysis tells us how South Africa really works – and how we can all pitch in to make it better. After matric Lesley took a gap year to the United States. Before she left, her mother, in jest or premonition, said: “Don’t get married and don’t join a cult” – but Lesley ended up in what is considered one of the most dangerous existing cults in America. In this book Lesley shares the story of her life-changing years with this group – living out of a backpack, an arranged marriage to a Brother, having home births, threats of losing her children and surviving in strange, glorious ways. The book is told largely through a series of letters exchanged between Smailes and her mother. I was twenty-six years old and an associate beauty editor at Lucky, one of the top fashion magazines in America. That’s all that most people knew about me. But beneath the surface, I was full of secrets: I was a drug addict, for one. A pillhead. I was also an alcoholic-in-training who guzzled warm Veuve Clicquot after work alone in my boss’s office with the door closed; a conniving and manipulative uptown doctor-shopper; a salami-and-provolone-puking bulimic who spent a hundred dollars a day on binge foods when things got bad (and they got bad often); a weepy, wobbly, wildly hallucination-prone insomniac; a tweaky self-mutilator; a slutty and self-loathing downtown party girl; and – perhaps most of all – a lonely weirdo. But, you know, I had access to some really fantastic self-tanner. By the age of 15, Cat Marnell longed to work in the glamorous world of women’s magazines – but was also addicted to the ADHD meds prescribed by her father. Within 10 years she was living it up in New York as a beauty editor at Condé Nast, with a talent for ‘doctor-shopping’ that secured her a never-ending supply of prescriptions. Her life had become a twisted merry-go-round of parties and pills at night, while she struggled to hold down her high-profile job during the day. Witty, magnetic and penetrating – prompting comparisons to Bret Easton Ellis and Charles Bukowski – Cat Marnell reveals essential truths about her generation, brilliantly uncovering the many aspects of being an addict with pin-sharp humour and beguiling style. The details of most PDBs are highly classified, and will remain so for many years. But the process by which the intelligence community develops and presents the Book is a fascinating look into the operation of power at the highest levels. David Priess, a former intelligence officer and daily briefer, has interviewed every living president and vice president as well as more than one hundred others intimately involved with the production and delivery of the president’s book of secrets. He offers an unprecedented window into the decision making of every president from Kennedy to Obama, with many character–rich stories revealed here for the first time. Technology moves fast – so where will it have taken us by 2050? How will it affect the way we live? And how far are we willing to let it go? In Megatech, distinguished scientists, industry leaders, star academics and acclaimed science-fiction writers join journalists from The Economist to explore answers to these questions and more. Twenty experts in the field, including Nobel prize-winner Frank Wilczek, Silicon Valley venture-capitalist Ann Winblad, philanthropist Melinda Gates and science-fiction author Alastair Reynolds identify the big ideas, fantastic inventions and potentially sinister trends that will shape our future. Join them to explore a brave new world of brain-computer interfaces, vat-grown cruelty-free meat, knitted cars and guided bullets. The writers predict the vast changes that technology will bring to everything from food production to health care, energy output, manufacturing and the military balance. They also consider the impact on jobs, and how we can prepare for the opportunities, as well as the dangers, that await. Thought-provoking, engaging and full of insight from the forefront of tech innovation, Megatech is essential reading for anyone who wants to understand tomorrow’s world. How can we explain the origins of the great wave of paranoid hatreds that seem inescapable in our close-knit world – from American ‘shooters’ and ISIS to Trump, from a rise in vengeful nationalism across the world to racism and misogyny on social media? In Age of Anger, Pankaj Mishra answers our bewilderment by casting his gaze back to the eighteenth century, before leading us to the present. He shows that as the world became modern those who were unable to fulfil its promises – freedom, stability and prosperity – were increasingly susceptible to demagogues. The many who came late to this new world or were left, or pushed, behind, reacted in horrifyingly similar ways: intense hatred of invented enemies, attempts to re-create an imaginary golden age, and self-empowerment through spectacular violence. It was from among the ranks of the disaffected that the militants of the 19th century arose – angry young men who became cultural nationalists in Germany, messianic revolutionaries in Russia, bellicose chauvinists in Italy, and anarchist terrorists internationally. On January 21st, 2017, five million people in 82 countries and on all seven continents stood up with one voice. The Women’s March began with one cause, women’s rights, but quickly became a movement around the many issues that were hotly debated during the 2016 U.S. presidential race immigration, health care, environmental protections, LGBTQ rights, racial justice, freedom of religion, and workers’ rights, among others. In the mere 66 days between the election and inauguration of Donald J. Trump as the 45th President of the United States, 673 sister marches sprang up across the country and the world. ABRAMS Image presents Why I March to honour the movement, give back to it, and promote future activism in the same vein. All royalties from the sale of the book will be donated to non-profit organisations affiliated with the March. The epic and controversial story of a major breakthrough in cell biology that led to the creation of some of the world’s most important vaccines. Until the late 1960s, tens of thousands of children suffered crippling birth defects if their mothers had been exposed to rubella, popularly known as German measles, while pregnant; there was no vaccine and little understanding of how the disease devastated foetuses. In June 1962, a young biologist in Philadelphia, using tissue extracted from an aborted foetus from Sweden, produced safe, clean cells that allowed the creation of vaccines against rubella and other common childhood diseases. Two years later, in the midst of a devastating German measles epidemic, his colleague developed the vaccine that would one day wipe out homegrown rubella. The rubella vaccine and others made with those foetal cells have protected more than 150 million people in the United States, the vast majority of them preschool children. The new cells and the method of making them also led to vaccines that have protected billions of people around the world from polio, rabies, chicken pox, measles, hepatitis A, shingles and adenovirus. Meredith Wadman’s masterful account recovers not only the science of this urgent race, but also the political roadblocks that nearly stopped the scientists. She describes the terrible dilemmas of pregnant women exposed to German measles and recounts testing on infants, prisoners, orphans and the intellectually disabled, which was common in the era. These events take place at the dawn of the battle over using human foetal tissue in research, during the arrival of big commerce in campus labs, and as huge changes take place in the laws and practices governing who ‘owns’ research cells and the profits made from biological inventions. It is also the story of yet one more unrecognized woman whose cells have been used to save countless lives. With another frightening virus imperilling pregnant women on the rise today, no medical story could have more human drama, impact, or urgency today than The Vaccine Race. Victor Sebestyen’s intimate biography is the first major work in English for nearly two decades on one of the most significant figures of the twentieth century. In Russia to this day Lenin inspires adulation. Everywhere, he continues to fascinate as a man who made history, and who created a new kind of state that would later be imitated by nearly half the countries in the world. Lenin believed that the ‘the political is the personal’, and while in no way ignoring his political life, Sebestyen focuses on Lenin the man – a man who loved nature almost as much as he loved making revolution, and whose closest ties and friendships were with women. The long-suppressed story of his ménage a trois with his wife, Nadezhda Krupskaya, and his mistress and comrade, Inessa Armand, reveals a different character to the coldly one-dimensional figure of legend. Told through the prism of Lenin’s key relationships, Sebestyen’s lively biography casts a new light on the Russian Revolution, one of the great turning points of modern history. Between the first revolution in February 1917 and Lenin’s Bolshevik coup in October, Petrograd (the former St Petersburg) was in turmoil. Foreign visitors who filled hotels, bars and embassies were acutely aware of the chaos breaking out on their doorsteps. Among them were journalists, diplomats, businessmen, governesses and volunteer nurses. Many kept diaries and wrote letters home: from an English nurse who had already survived the sinking of the Titanic; to the black valet of the US Ambassador, far from his native Deep South; to suffragette leader Emmeline Pankhurst, who had come to Petrograd to inspect the indomitable Women’s Death Battalion led by Maria Bochkareava. Drawing upon a rich trove of material and through eye-witness accounts left by foreign nationals who saw the drama unfold, Helen Rappaport takes us right up to the action – to see, feel and hear the Revolution as it happened. Carly Simon is a household name. She was the staple of the ’70s and ’80s Billboard charts and was famously married to James Taylor with whom she has two children. She has had a career that has spanned four decades, resulting in thirteen top 40 hits, including the Number 1 song ‘You’re So Vain’, numerous Grammy Awards, a Golden Globe and an Academy Award. She was the first artist in history to win a Grammy Award, an Academy Award and a Golden Globe Award for her song ‘Let the River Run’ (from the film Working Girl). Boys in the Trees is a rhapsodic, beautifully composed memoir of a young woman’s coming of age amongst the glamorous literati and intelligentsia of Manhattan (her father was Richard Simon, co-founder of publishing giant Simon & Schuster), a reflection on a life begun amidst secrets and shame, and a powerful story of the strength to leave that all behind and forge a path of art, music and love in the Golden Age of folk and rock. 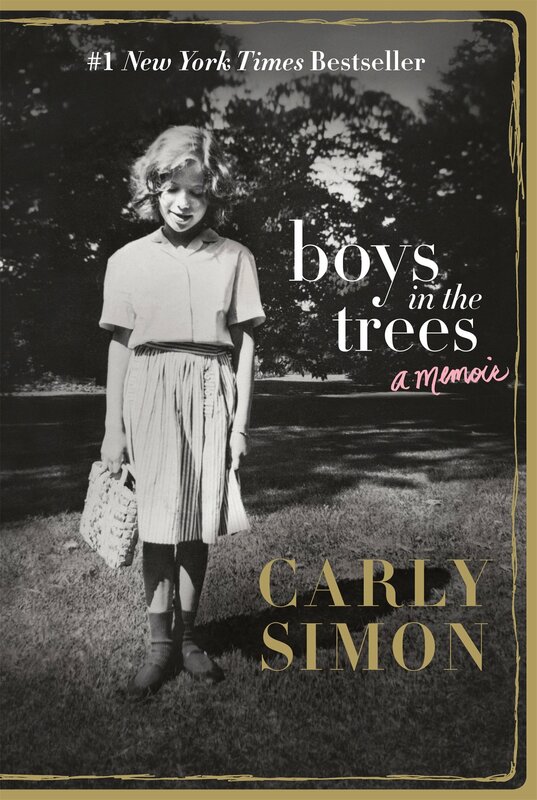 At once an insider’s look into a life in the spotlight, a lyric reflection on a particular time in our culture’s history, and a beautiful memoir about the pains and joys of love and art, Boys in the Trees is the story Carly Simon has long been waiting to tell the world.